Everyone knows that a trip to Seattle isn’t complete without a visit to the world famous Space Needle. 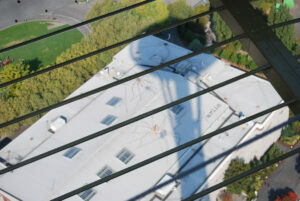 Built for the 1962 World’s Fair, the Needle is the quintessential Seattle attraction – for visitors and locals alike. My oldest son is three years old and has been asking to take a trip to the needle since he could utter the words with his little toddler vocabulary. This weekend the sun was shining and I was happy to oblige. 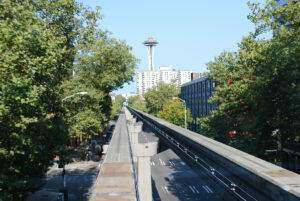 In just two minutes, the Seattle Center Monorail takes visitors from the downtown shopping district to the 74-acre Seattle Center. 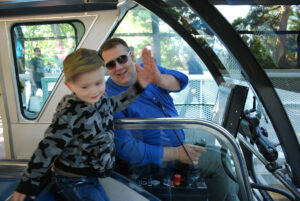 We started the trip with a ride aboard the Seattle Center Monorail. The monorail leaves from Westlake Center (at 5th Avenue & Pine Street) in downtown Seattle, every 10-minutes for an unforgettable ride to the Seattle Center. Momma Tip: Be the first to board, head to the north end of the train, and snag the front row seat next to the driver. Not only do you get a fantastic viewpoint out the huge front windows, but your little one might be lucky enough to high-five the driver or even honk the monorail’s impressively loud horn, sounding the start of the trek. It’s fun to sit up front with the driver. 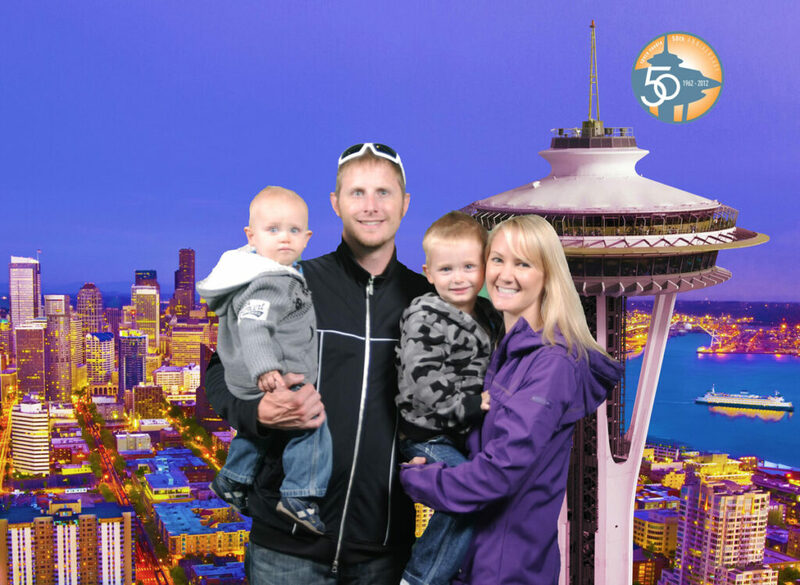 Upon arrival, we jumped off the monorail and walked straight over to the Space Needle. Luckily we arrived shortly after it opened (9:30 a.m. on weekends). I know the line can get long as the day progresses. Momma Tip: Strollers are NOT allowed up the golden elevators onto the Observation Deck or SkyCity restaurant. If you’ve brought one, you’ll need to park it outdoors by the ticket booth. A better idea is to bring a backpack to stash your kiddo’s items so you’re not carrying around your little one, a camera and a bag or purse, since you can’t place them below in the stroller’s stowaway space. We packed ourselves into the elevator and headed up to the O-Deck. Once there, we spent time exploring the sights. With the 360-degree-view, you can see Puget Sound, Lake Union, the University of Washington, into downtown Seattle, and a birds-eye-view of the Seattle Center grounds down below. Momma Tip: Look for the building with GIANT spiders on top. My kids got a kick out of it! After playing outdoors and taking some pictures, we went inside to maneuver the games and learning opportunities that abound with SkyQ, their interactive kiosks. Bonus Momma Tip: Upon arrival at the needle, they’ll take your picture (see top photo) and give you a code to download at kiosks upstairs. Unless you want to leave the needle with a printed copy of your family fun photo, don’t spend time waiting in line – you can also download the picture at home for free! The boys were a bit restless, so we weren’t able to enjoy lunch at SkyCity on this trip. Although it’s an impressive dining experience, it’s also welcoming to toddlers, receiving rave reviews as a kid-friendly restaurant from local parent blogs like Red Tricycle. Instead we opted to have lunch at the newly designed Armory – with more than a dozen quick (and some upscale) dining options. A final Momma Tip: We elected to eat at MOD Pizza, where they create individual sized custom-made wood-oven fired pizzas before your very eyes for just $6.88 each, regardless of the toppings you pick! We took our pizzas outside and basked in the sun under the shadow of the Space Needle. The perfect way to end our morning trek. 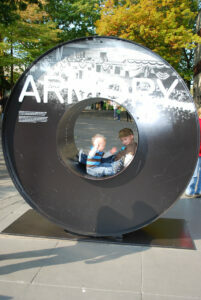 Next time we come for a family friendly day at the Seattle Center, the Seattle Children’s Museum is on the docket! And, of course, another ride aboard the monorail…HONK!